How much does it cost to travel to Kiev? How much money will you need in Kiev? ₴815 ($30) is the average daily price for traveling in Kiev. The average price of food for one day is ₴235 ($8.75). The average price of a hotel for a couple is ₴1,075 ($40). Additional pricing is in the table below. These average travel prices have been collected from other travelers to help you plan your own travel budget. Kiev is the capital city and also the largest city in the Ukraine, with a population of almost 3 million in the metropolitan area. It is situated on the Dnieper River in the north central part of the country and is one of the oldest cities in Eastern Europe, dating back to the fifth century. The people in Kiev are quite friendly and welcoming, and are happy to have you in their city. It can, however, be difficult to communicate and get around if you don't speak at least a little Russian. It is doable with a little sign language and the help of a guide book with translations though. The climate in Kiev is humid continental and the warmest months are between June and August when the average temperature can range from 13 to 25 degrees Celsius. The winter months between December and February have an average temperature that ranges from -5 to -1 degrees Celsius. You can expect snow on the ground between mid November and the end of March. There are many museums, restaurants, and sights in the area that are worth checking out. Khreschatyk Street is the main entertainment street through the middle of town. It sometimes closes to vehicular traffic on weekends and you can often see street performers or musicians along it. It's a great place for some people watching and a nice spot to take in every day life in Kiev. Popular sights in Kiev include Kiev Pechersk Lavra, St. Sophia's Cathedral, St. Michael's Golden Domed Monastery, and Motherland Statue and War Memorials, among many others. Popular museums include the Chornobyl Museum, the open air Museum of Folk Architecture and Rural Life, and the State Aviation Museum. Administratively, Kiev is divided into raions, or districts. The reions include Darnytsia, Desna, Dnipro, Holosiiv, Obolon, Pechersk, Podil, Shevchenko, Solomianka, and Sviatoshyn. Informally, the city is divided into the Right Bank and the Left Bank by the Dnieper River. The islands in the river belong to the left bank raions. The oldest parts of the city are found on the Right Bank, or western side of the river. This is also where you'll find most of the city's businesses and governmental institutions. The Left Bank, or eastern side of the river, is mostly residential. There are some large green areas as well. 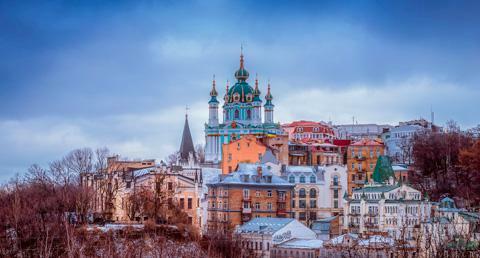 There are many different activities that you can enjoy in Kiev. These include visiting Hidropark Island, walking around Podil and people watching on Kreshchatyk. It's also interesting to visit an Orthodox Church while you're in town. There are also two water parks in town. Dream town aqua park is on the left bank of the city and is one of the biggest indoor water parks in Europe. Aqua park Terminal is a large water park with plenty of slides and pools, including a wave pool. Eating out can be very cheap in Kiev, particularly by European standards. It is best to avoid places that cater specifically to tourists. Popular dishes you should try while you're in town include borscht, chebureki, chicken Kiev, and Mlyntzi. You can also find plenty of delicious, cheap baked goods around town. Budget restaurant options around town include fast food chains such as Domashnia kukhnia, Mister Snack, Two Geese, and Olivie. In addition to traditional Ukrainian food, you can also find Mexican, Italian, and even sushi around town. Kiev can be somewhat overwhelming to western tourists because many of the signs are in Cyrillic script and few locals speak much English. The metro is one of the best ways to get around the city. It is clean and fast and relatively easy to navigate. There are three lines, each of which goes through the city center. As recently as 2012, many of the signs and maps have names written in English to assist foreign travelers. Buses and trolleybuses can be caught at any of the marked stops. They can be crowded, particularly during rush hours, so you may have to push your way on. Also available are route taxis that travel specific routes. You can wave these buses down from their stops and you pay the driver directly. You have to tell the driver when you reach your stop. There are also two types of taxis in Kiev; official company taxis and gypsy cabs. Gypsy cabs are unmarked vehicles that will offer you a ride. Make sure you negotiate the price hard. Prices can vary dramatically depending on the day, weather, traffic conditions, and, of course, your negotiating skills. You can wave down official taxis or call them by phone. You can usually reach someone who speaks English on the phone.